Artist prepping mural for "Time Kills Art"
An eagle-eyed imbiber of Foam Brewers beer might notice a sly message on each of its 16-ounce cans: "Time Kills Art." In the case of an IPA, this postmodern manifesto is an exhortation to drink while fresh. On Saturday, March 23, the Lake Street suds factory in Burlington will host a reception of the same name to showcase the work of 17 artists. The event will also christen a 2,000-square-foot expansion in its building across from Waterfront Park. 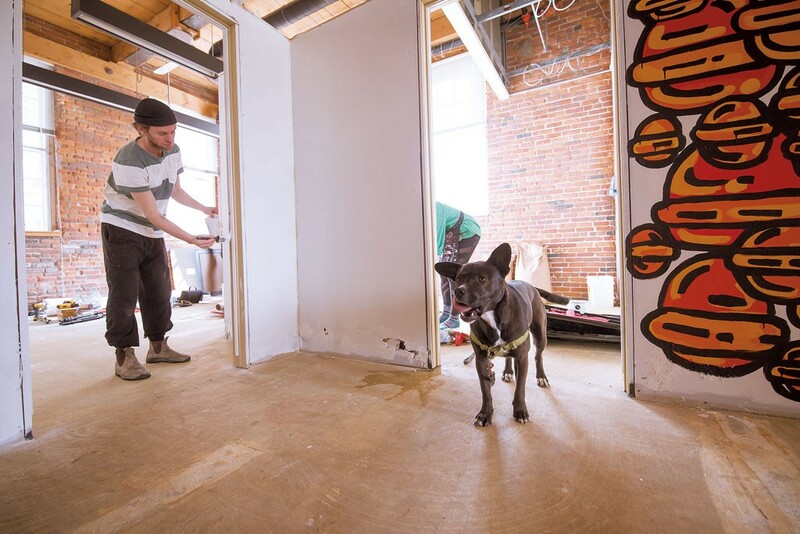 In January, Foam leased the adjacent first-floor space, formerly a warren of law offices and therapy practices. During the week leading up to the reception, the artists — all of whom have previously collaborated with the brewery on can-label art, graphic design and multimedia content — will paint murals on false interior walls. "Most of the artists will likely finish their murals before the event, but there'll probably be some live painting going on, too," said Foam marketing and administrative coordinator Adam Karas. Then, a week or two after the show, those murals will be demolished to prepare for renovations. Hence, time kills art. The participating artists hail mostly from Vermont and New England. Burlington-based artists include New Yorker-published illustrator Sarah Letteny, who has lent her whimsical goth aesthetic to ¡Duino! (Duende) and Maglianero Café; and Burton Snowboards designer Jackson Tupper. Painter Charlie Hudson, a University of Vermont grad now living and working in New York City, will also be part of the show. He has previously created murals for Burlington International Airport, the Skinny Pancake and ArtsRiot. Photographer and music video producer Kayhl Cooper of Noise Ordinance will project some of his videos. Each artist will have work for sale, ranging from photos and prints to illustrations and paintings. Karas said the event is meant to feel like an art opening, with a rotating cast of DJs spinning throughout the evening and small plates provided by Guthrie Galileo of Nightshade Kitchen. For drinks: Foam beer, of course, plus Citizen Cider and wine from Shelburne Vineyard. "Our goal is to bring the art community together," said Karas. "This is less about beer than about getting people to appreciate the incredible talent of these folks." When Foam first acquired the new space, said Karas, it had "a very '90s 'Law and Order' vibe, with all these funny wood fixtures that served no purpose." Now, in its pre-construction state, it's clean and bright — a 2,000-square-foot blank canvas. Correction: March 20, 2019: An earlier version of this story misidentified the location of one of Charlie Hudson's murals. The original print version of this article was headlined "Creative Destruction at Foam Brewing"